providing an opportunity to remove some of the more detailed questions from the survey and asking more engaging, attitudinal items. This helps reduce the effort required to complete the survey and enhances the survey experience for participants! Linking LSAY to school results: LSAY participants were asked permission to link survey data with their school results. This means linking NAPLAN scores from Years 3, 5, 7 and 9 and senior secondary school subject results (Years 11 and 12) to the survey data. For more information please read our fact sheet on linking school results to LSAY data. Linking LSAY to Higher Education (university): LSAY participants taking part in Higher Education (university) study are asked for their permission to link their survey responses to data from the Higher Education Information Management System (HEIMS). For more information please read our fact sheet on linking Higher Education (university) records to LSAY data. Participants are asked for their consent to link their LSAY records to other educational data sets and only those who consent will have their data linked. Participants can withdraw their consent at any time, however any data that have already been linked will be retained and continue to be available to data users. 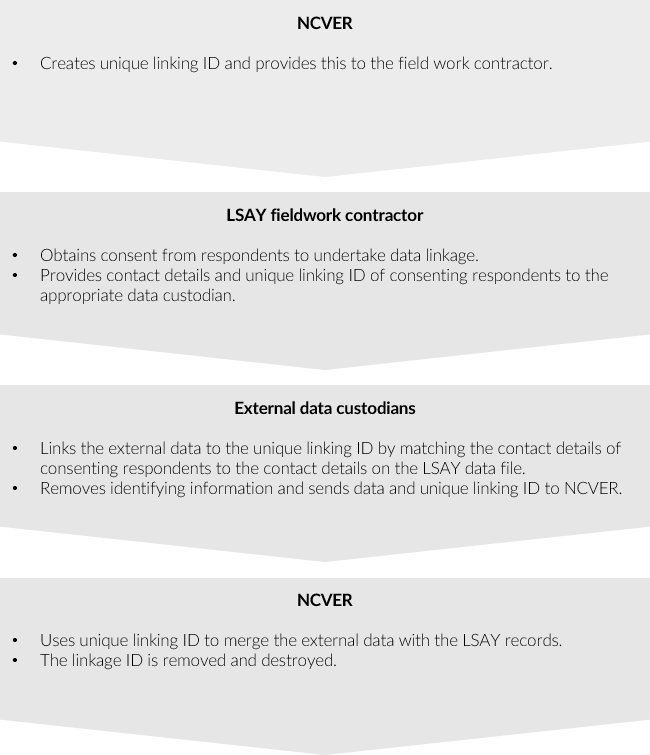 LSAY data will be linked via deterministic linking which compares an identifier or a group of identifiers across databases; a link is made when these identifiers match. Types of identifiers used to match LSAY data and other administrative data include contact details (name, address, date of birth), school information (name, suburb, postcode) or a participant’s unique student identifier (USI). Personal information is handled in the strictest confidence in accordance with the Australian Privacy Principles. Respondent contact details are only ever held by Wallis (the LSAY fieldwork contractor) or the agencies authorised to do the linkage and are stored on secure servers located within Australia. All LSAY linkage projects are conducted using the separation principle which ensures the separation of personal identifying information (e.g. names, addresses, and unique identifiers) from administrative and survey data. A linkage key is developed to link the datasets so at no point are survey data and identifying information contained on the same file. For more information on the linkage process specific to each project see the fact sheets above. De-identified linked data are stored on secure servers by NCVER and the Australian Data Archive (ADA) where they are made available to researchers. Data use is restricted to research purposes only and cannot be used for commercial or financial gain. When researchers use the data, information is always grouped together to ensure no individual can be identified. See the our privacy notice for more information. Access to the linked data is restricted and will be available via a formal request and registration process. Further information on how to access the linked data will be available when the data is deposited with the Australian Data Archive.